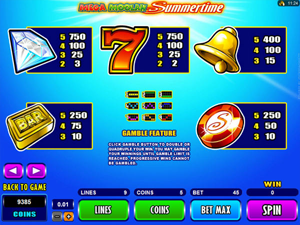 Mega Moolah Summertime is a five-reel nine-payline progressive slot released by Microgaming. The game features wilds, scatters, free spins, and a record-breaking four-tier progressive available to everyone. The game is a perfect option for jackpot seekers, penny slotters and classic slot enthusiasts, since Microgaming has blended all of the mentioned in one stunningly attractive slot machine that fits every budget. Mega Moolah Summertime is a high-tech cocktail consisting of classic Vegas-style symbols generously spiced with fruit symbols – and all topped with a massive progressive jackpot. 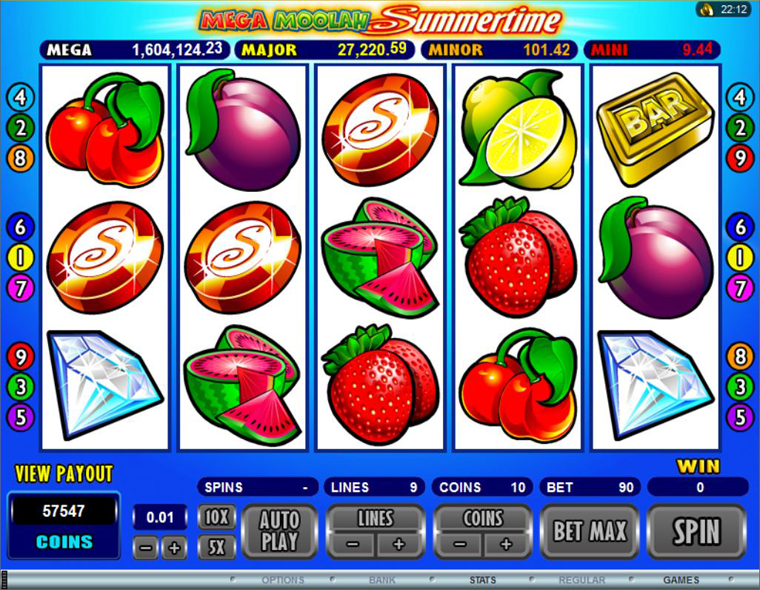 There are plenty of juicy fruits and berries in the slot reminding you of hot summer days. On the reels, you will come across plums, strawberries, lemons, cherries, oranges and watermelons. These are low-pay symbols that grant up to x125 a line bet for three–five matching symbols. The Vegas-style icons often used in mechanical slot machines produce mid- and high-paying combinations. These include casino chips with a dollar sign engraved (x250), BAR golden plates (x250), bells (x400), sevens (x750) and diamonds (x750). the number of lines for wagering a bet varies from 1 to the slot’s maximum of 9. Therefore, the floor and ceiling bets are $0.05 and $2.25. The Summertime logo acts as a wild and wild multiplier. It has the power to create winning combinations by substituting missing icons. As a wild multiplier, the Summertime logo doubles the payouts for combos it is used in. Get two to five wilds on an active payline, and you’ll be awarded x10 to x10000 times a bet, the latter being the slot’s highest fixed jackpot. The symbol depicting sand and waves with the printed word ‘Scatter’ does not need to appear on a specific payline. Once 2¬–5 of them display scattered anywhere on the reels, you get up to x500 times a total bet. Besides, three scatters activate 15 re-triggerable free games with all the wins tripled. Mega Moolah Summertime is linked to a progressive jackpot network accumulated when a bet is wagered in whichever of the four Mega Moolah slots. Jackpot meters are displayed above the reels. There are no conditions you must meet to stand the chance of hitting a jackpot, as it is awarded at random. You may choose playing at max or betting $0.01 per spin, and you still qualify. The four jackpots named Mini, Minor, Major and Mega vary in size and have different starting values, with the largest one starting at $1,000,000. The Jackpot Wheel bonus games may be triggered any time. You will be taken to the second screen featuring a wheel with 20 colored sections. The wheel gets spun, then it stops, and the pointer will show the colored sector that corresponds to one of the four jackpot types. Note that you are guaranteed to win, once you get in this bonus game. Mega Moolah Summertime is a progressive slot with a summer-themed twist featuring wilds, scatters, free spins and a mind-boggling progressive jackpot exceeding 1M.